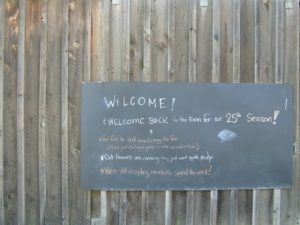 Sign welcoming CSA members, who pick up shares at Roxbury Farm, says to enjoy the farm but not to open gate and enter animal pastures. 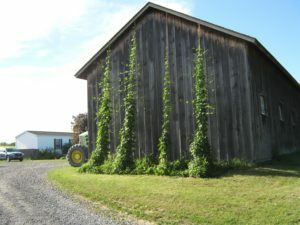 Roxbury Farm cultivating hops on the sunny side of a farm building. 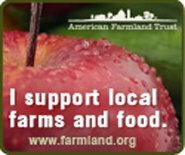 Members of Community Supported Agriculture (CSA) farms are savoring the start of the 2016 farm season. Just Food, a praiseworthy organization based in New York City, each year connects nearly a quarter million New Yorkers with fresh food through its network of community food projects. And the organization offers special training for Gotham residents “to start and manage CSA projects in partnership with approximately 40 regional farms.” From one CSA in 1995, Just Food now assists more than 100 CSA programs. Farms that work with Just Food include Roxbury Farm in Kinderhook (Columbia County, NY). This writer for the past few years has enjoyed a CSA share in Roxbury Farm, which also has weekly delivery of farm shares to the Capital Region of upstate New York, including a pick-up site in a nearby neighbor’s garage in my Albany neighborhood. Salad Mix: Wash your salad mix, then dry it in a salad spinner or with paper towels and store in a vented plastic bag in your fridge for over a week. If you store it wet, it won’t last for more than a few days. Basil: Store in a glass of water on your kitchen counter like cut flowers and wash just before you use it. Cilantro and parsley: Wash and dry your parsley and cilantro and then store in a vented plastic bag and wash just before you use them. Bunches of greens (like kale): Dry the bunches with a paper towel, store in a vented plastic bag and wash just before you use them. Zucchini and summer squash: The fridge is too cold for them so store them in a cool place in your kitchen and wash just before you use them. Radishes: Blot the tops dry with a paper towel and store in a vented plastic bag in your fridge. Turnips: You can eat the greens or treat them like radish tops and store in a vented plastic bag in your fridge. Kohlrabi: Separate the leaves from the bulb and the bulb can be stored in your crisper drawer in your fridge. Peel the bulb before you eat it. You can also eat the leaves, similar to kale, but a bit tougher. To be a part of a CSA farm means sharing in the life of a community that knows the farmers who grow its food, how it’s grown, and the specific spot on our planet where its food comes from. 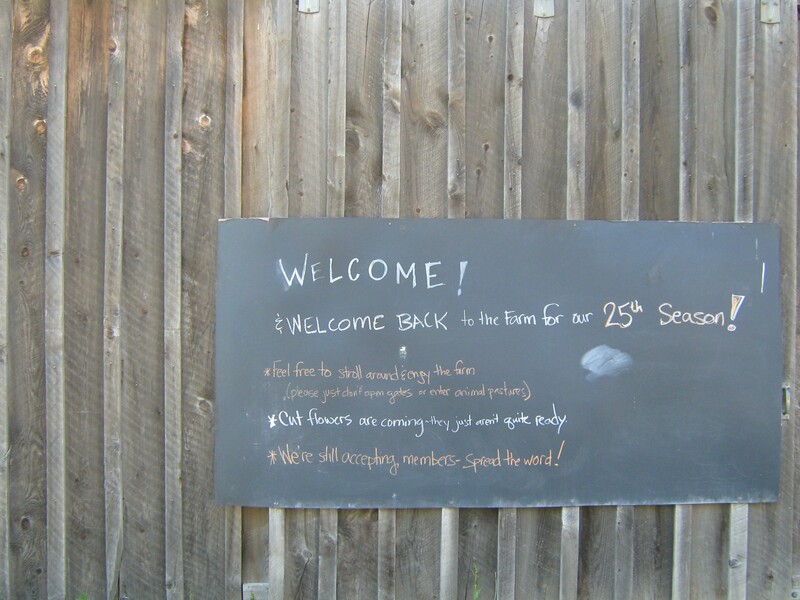 Each CSA is unique and offers special connections for members: from opportunities to enjoy a stroll on the farm and a weekly Letter From The Farmer, such as offered to its members by Roxbury Farm, to foraging classes and a solstice gathering on the longest day of the year offered to CSA members by Co-op 518 (a CSA farm in Princeton, New Jersey) or the special commitment and relationship between members of a full-diet, year-round CSA like Essex Farm (Essex, NY) and the on-going communications from hardworking, plus literary, farmer Kristen Kimball, author of The Dirty Life, A Memoir of Farming, Food, and Love, whose poetic and insightful Essex Farm Notes to her farm’s CSA members make for real awareness of the changing seasons. Directories of CSAs throughout the United States and Canada are included on this website. And there’s still time to participate. Very likely, a slight reduction of the seasonal cost, typically $450-$700, would be offered for a late start of membership if shares are still available.